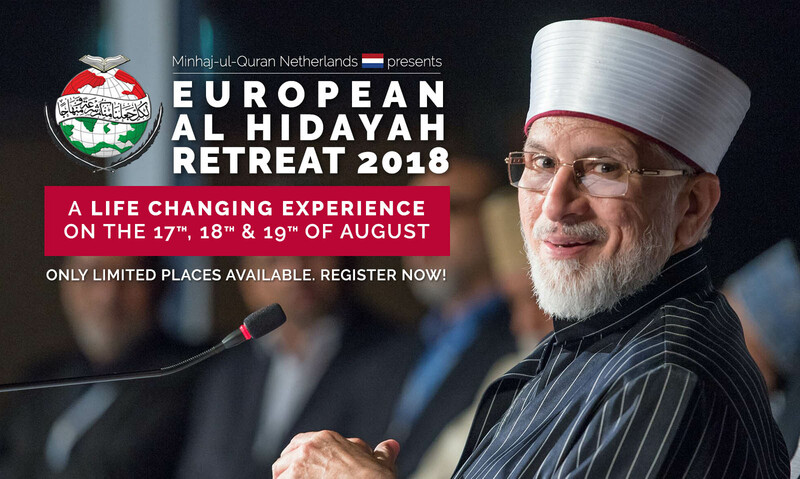 Al Hidayah (meaning ‘The Guidance’) changed and enlightened many lives and we invite you to the Heavenly Call of Guidance of Allah and His Beloved Prophet (saw) this summer of 2018 in The Netherlands. 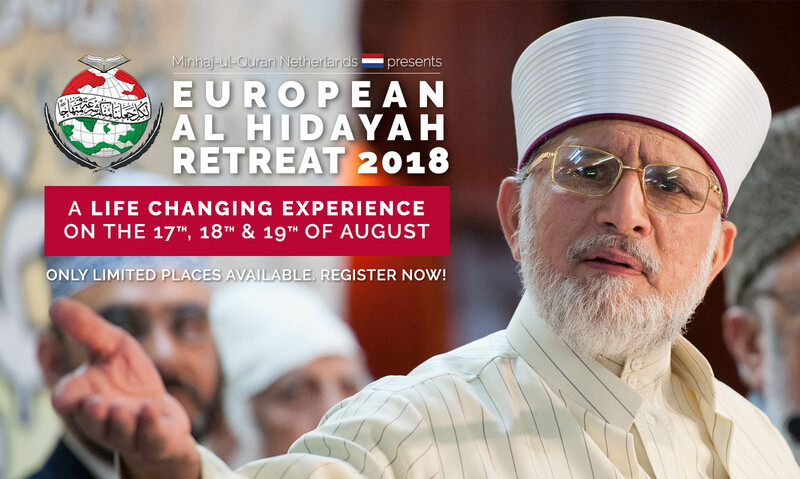 Be part of this life changing journey..
MQI Netherlands is truly honored to receive the great blessing of hosting a three day European Al Hidayah Retreat. Al Hidayah is a concept established by Minhaj-ul-Quran International in 2006. A three day retreat with His Eminence Shaykh-ul-Islam Dr. Muhammad Tahir-ul-Qadri with the sole purpose of providing spiritual uplift, personal development and simultaneously training participants in the spiritual and peaceful vision of Minhaj-Ul-Quran International. Our participants experience the Al Hidayah Retreats as the starting point of true change in their lives. 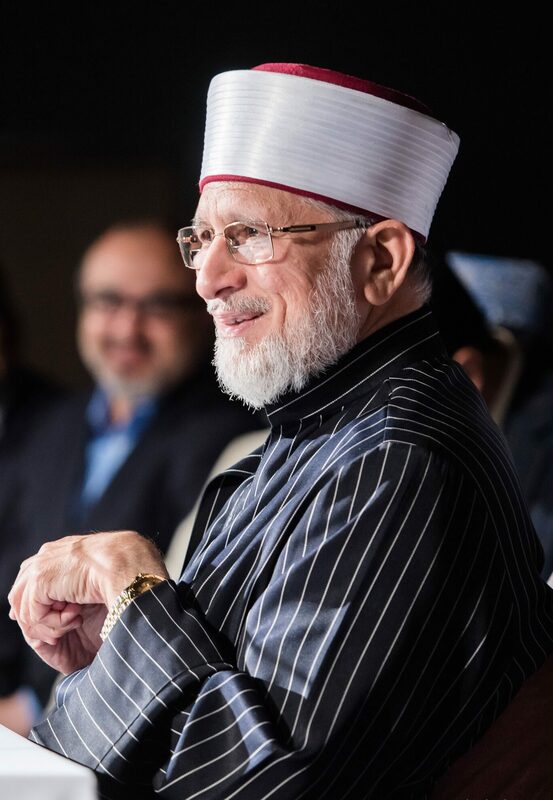 Youth from accross Europe acquire authentic sacred knowledge from His Eminence Shaykh-ul-Islam and they embrace the unique opportunity to develop their moral characters through religious engagement, spiritual gatherings and congregational prayers. 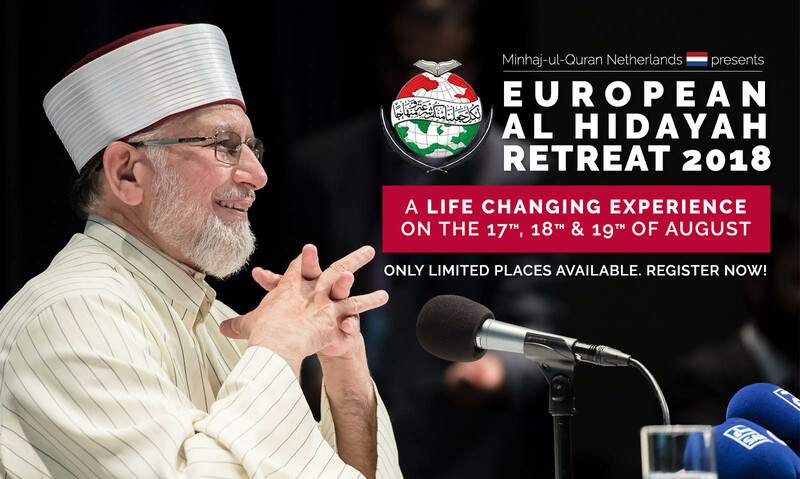 MQI Netherlands is working diligently to host a wonderful experience for you all. We would like to take you with us on this journey, leading up to the big moment. That is why we have made a video in which you will be taken with our team to the hotel to show you around and you can get a climpse of what you can expect. 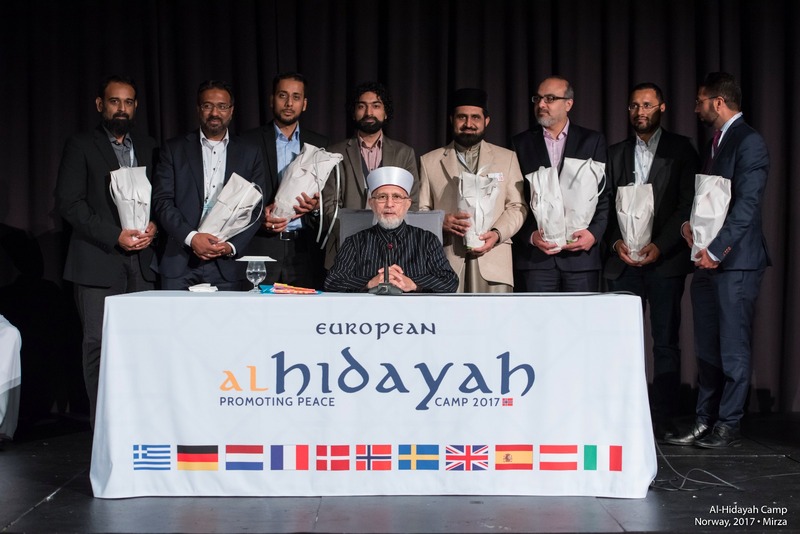 In 2005 Minhaj-ul-Quran International UK held the first Al Hidayah Retreat which targeted the British Muslims, and inviting the foremost Islamic scholars from around the world with 300 young people attending from around the UK. It was the first time such an event was held for Minhaj youth members living in the West. The success of this event made it possible in the following years to open up for international communities which resulted in many more retreats including the first European retreat in Norway. This year The Netherlands and Denmark both have the honor to host a three-day and a one-day retreat to serve the European youth develop for bright futures. Al Hidayah’s aim is to guide you with becoming a dynamic and compassionate citizens of your country and community. We will help you to grow spiritually, psychologically and practically, and to develop your critical thinking. In this unique retreat you will gain skills and confidence to become positive change-makers within your immediate and further communities, and within your chosen fields of work and study. Our aim is to maximise your potential as a young person for the eventual benefit of society. Be part of this life changing experience. Be part of Minhaj ul Quran’s Al Hidayah Legacy. Register now! Enlighten your heart with the blessed Sohbah of one the greatest scholars of this time. Dr Qadri is the founder and head of Minhaj-ul-Quran International (MQI), an organisation with branches and centers in more than ninety countries around the globe; he is the chairman of the Board of Governors of Minhaj University Lahore, which is chartered by the Government of Pakistan; he is the founder of Minhaj Education Society, which has established more than 600 schools and colleges in Pakistan; and he is the chairman of Minhaj Welfare Foundation, an organization involved in humanitarian and social welfare activities globally. Dr Qadri has spent his whole life in an indefatigable effort to counter religious extremism and promote peace and harmony between communities. His painstaking research into the Qur’an, Hadith and classical Islamic authorities has resulted in landmark works demonstrating Islam as a religion that not only safeguards human rights, but promotes peace, tolerance and socioeconomic progress. He has traveled extensively to lecture at the invitation of governmental and non-governmental agencies, and has organised and took part in international conferences in order to promote global peace. He has arrayed spiritual and educational training programmes across the Western world with a focus on addressing the roots of religious extremism. When not travelling, he is based in Canada, busy in his research activities and producing vital works of Islamic scholarship relevant to Muslims in this day and age. 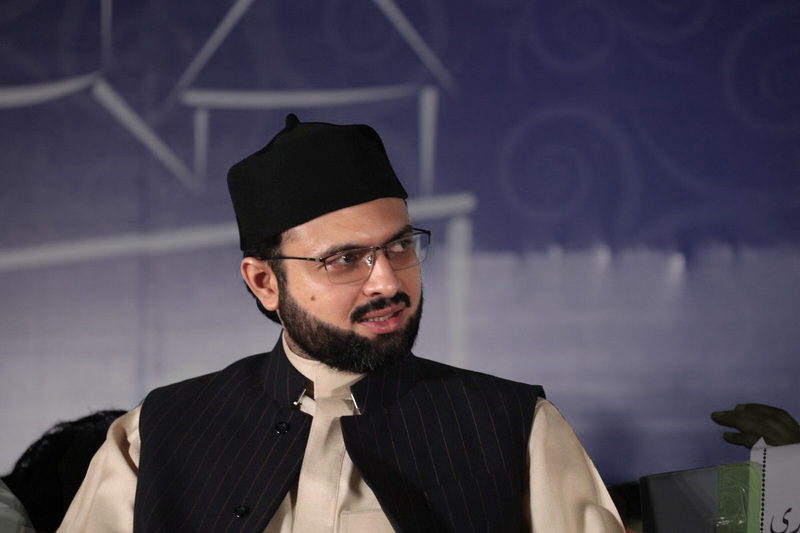 Dr. Hassan Qadri is the Chairman Supreme Council of Minhaj-ul-Quran International and is recognised as a young renowned Islamic scholar, who is a prolific orator and an energetic human rights campaigner, internationally highlighting Islam as a religion of peace and harmony for all mankind. Dr. Hassan has received his Doctorate degree from the biggest Islamic University which resides in Cairo Egypt. He has written a comprehensive thesis in Arabic titled ‘The Constitution of Medina and Modern Constitutional Principles’ (A Comparative Study of American, British & European Constitutional Law). Dr. Hassan is also recognized as a constitutional lawyer creating a synthesis between modern and Islamic sciences by the World Economic Forum, declared as a well acknowledged young “Muslim and Champion of Unity worldwide” by the FARS news agency of Iran. Minhaj-ul-Quran has inspired many individuals that have become community leaders in their respective countries. In return of the favors they have received they have been inspiring us and will continue to inspire us during workshops during this coming Al Hidayah Retreat. Along with spiritual nights and seminars by the main speakers, you will also have the opportunity to attend various workshops given by these community leaders. You can expect workshops on themes like: Future Leaders, Muslims in Europe: towards a community of impact and purpose, Da’wah in modern times, Mission and married life, Stress management and mental health, Ethics of social media & safeguarding, Fundamentals of confident communication, Islamic and Western values: compatible or oxymoronic?, Spot and stop an extermist. All of these workshops have been highly valued by the participants as they added a great deal of skills and insight in their lives. 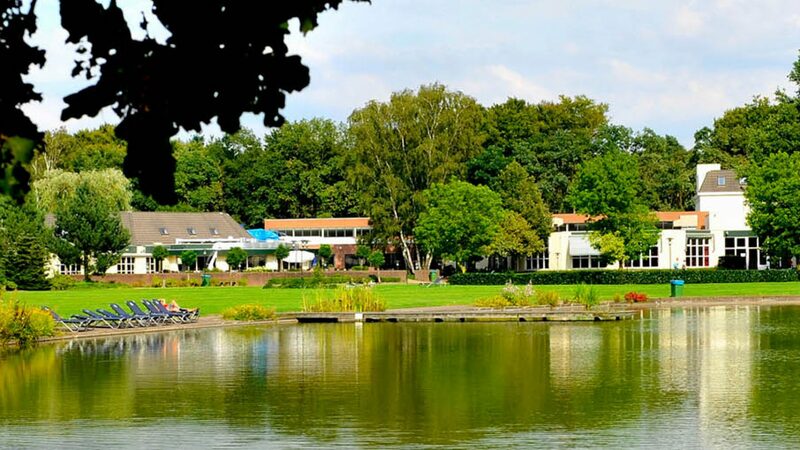 Accommodations for the 2018 al-Hidayah retreat will be provided in Arnhem, one of the Netherlands central cities. Given its location, travel to Arnhem will be convenient and easy to reach for all surrounding European countries, either by road or by air. The Four-star Fletcher Hotels will provide a beautiful and scenic environment, enabling participants to recharge their spiritual batteries. Participants will be accommodated in clean rooms with ensuite bathrooms. A full breakfast, lunch, and 3-course supper will be included, along with tea, coffee, and refreshments during breaks. Access to the hotel pool, tennis court, gym, and other facilities will be available. Hidden in the woods, in the south of the Veluwe but a mere stone’s throw away from the lively city of Arnhem. The Veluwe is one of the most versatile regions of the Netherlands with forests, moors, sand drifts alternating with fens and lakes. Veluwe is all nature and home to the oldest and biggest national parks of the Netherlands. Facilities summed up: 4-star hotel, 22 multifunctional meeting rooms, wheelchair accessible, attractive à la carte restaurant, free WiFi, fitness centre, tennis area, indoor and outdoor pool. You are only minutes away from completing your registration for a life changing experience. Please note that there are only limited places available! We recommend that you register and pay promptly to secure your spot through the registration form below. The price is €219 and registration is open for the age of 15 up to 45. Also take into account that your registration is only confirmed after a selection procedure. To avoid any inconvenience we once again emphasize to register and pay promptly so your place will not be given away to other people on the list. If you are registering from UK or outside Europe, please keep in mind the following: the European al-Hidayah is mainly targeting youth from the European mainland. So unfortunately there are very limited places for people from UK and other countries outside Europe. When you register, you will be placed on a waiting list. At the start of June 2018, we will let you know whether your registration is accepted or not. We will NOT engage in any discussion initiated by you , nor are we under any obligation to explain our final decision!